His Majesty the King appoints President Sarkozy Knight of the Illustrious Order of the Golden Fleece. January 2012, Madrid. On January 16th, Princess Letizia, her husband Prince Felipe, the King and Queen of Spain, many Spanish and French authorities and some Knights of the Order of the Golden Fleece like the Infante Don Carlos with his wife, the former King of Greece and the former King of Bulgaria with the Queen, attended the ceremony at the Royal Palace and a luncheon afterwards. Doña Letizia wore a raw wool black and white Felipe Varela dress, a Felipe Varela black coat, black pumps, a Mango patent leather two-tone clutch and black gloves. 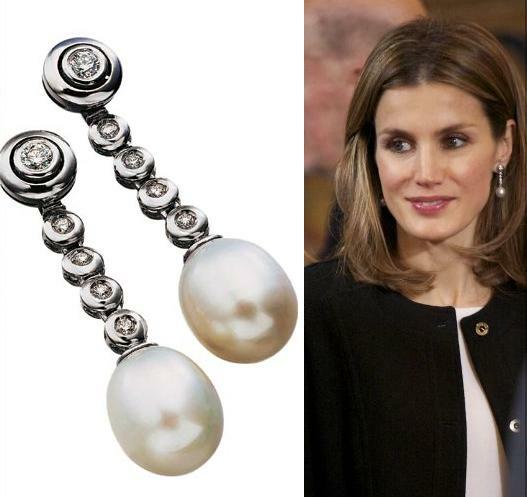 Besides her wedding and engagement rings, her jewellery consisted of white gold, diamonds and Australian pearls earrings and her Bulgari ring. The Princess has worn the earrings and ring in numerous occasions and the dress and clutch during a trip to Chile last November. « Working Meeting with the Spanish Association Against Cancer. January 2012, Madrid.